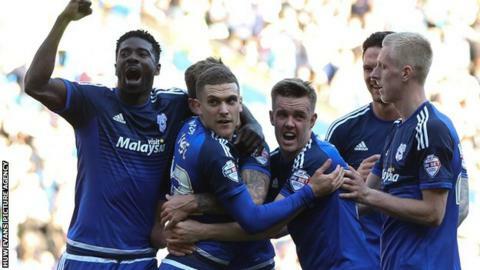 Stuart O'Keefe says it would be an "incredible" achievement for Cardiff City to gain promotion to the Premier League this season. The Bluebirds are two points outside the Championship play-off places after their 2-1 win over Derby. O'Keefe was in the Crystal Palace's 2013 play-off winning team, and believes Cardiff can repeat that feat. "I think it's a possibility. If we do it would be one of the greatest achievements for Cardiff," he said. "We had a budget cut, we've had an transfer embargo. "For us to make the play-offs and then possibly go up would be incredible for this group of lads, something special." O'Keefe scored Cardiff's winner against promotion-chasing Derby in a win he said was a "big statement" to the rest of the league. It lifted Cardiff to within two points of the Rams, who are in sixth place with seven matches of the regular season remaining. The game was played in front of a record crowd of 28,680 at Cardiff City Stadium, exceeding the 28,018 for a 6-3 Premier League defeat by Liverpool in 2014. Russell Slade's side have lost only twice in their last 10 matches, but face leaders Burnley in their next match on Tuesday. O'Keefe says the character shown by Cardiff after an indifferent start to the season could be a vital factor in their promotion chase. "It was a tricky start, it was quite inconsistent," he added. "But we've got a good group of lads here and we work hard every day and we've managed to sort of grind ourselves through that period. "We've got real belief now, especially at home that we can beat anyone in the league and be in the top six."